The late, great Helen M. Turner is perhaps my favorite artist in our collection. Born in Louisville, Kentucky in 1858, her 70 year career encompassed the full sweep of the American Impressionist movement. In 1921, her work was exhibited alongside Mary Cassatt’s in the Milch Gallery’s landmark exhibition Six American Women. I dislike linking her so quickly with Cassatt, but it seems to be the only way to put her in context; or at least the only way to underscore her oft-overlooked importance. Turner’s work is more impressionistic than Cassatt’s, and it is my humble opinion that throughout her career she took more risks with color and shadow. But I digress. Unlike many artists, her work was well received during her lifetime. Indeed, in 1921 she achieved the inestimable honor of being the third woman elected to the National Academy of Design; she was certainly the first Southern woman. Turner lived to the miraculous age of 99 (she passed away just shy of her 100th birthday, in fact) and scholarship on her work is slowly gaining momentum amongst art historians. Mark my words: interest in Helen M. Turner is about to explode. The Hermitage is fortunate to have what is perhaps the single largest public holding of Turner paintings (and sketches) anywhere in the world, including one which I believe is unique amongst her oeuvre entitled The Boudoir Mirror. It is currently tucked away in storage and in desperate need of conservation. Backstory: Turner has always been known for painting women. She painted women indoors at their leisure, outdoors amongst flowers, or otherwise engaged in solitary, feminine pursuits. Her subjects are typically alone (and if there is a companion, she is always female) and her settings are, as a rule, intimate and elegant. 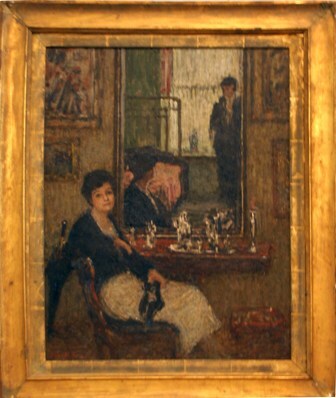 The Boudoir Mirror seems no exception to this rule: the foreground features a woman at her toilet, face turned casually toward the viewer, a pair of slippers slung loosely across her lap. An elaborate vanity set spreads out behind her and a sliver of bedroom is revealed in the reflection of an enormous mirror. But wait! Who is that dark figure reflected in the mirror? Is that… a man? [Image enlarged and enhanced for your mystery-solving pleasure]. Identify yourself, sir (or ma'am). I sent the photograph around the museum to see if we could come to a consensus. Opinion was divided down the middle — a few said man, others were convinced it was a woman. This is a Helen Turner painting after all. Next up: Asian Art spotlight with Colin (he of the dubious taste in t-shirts).